Sterile utensils are crucial in any kitchen. 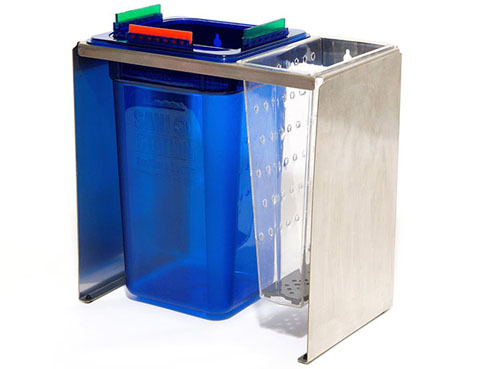 Sani Station is an easy-to-use utensil cleaner system that ensures you’re cleaning and sanitizing utensils properly. Our utensil sanitizer uses a no-rinse solution to thoroughly clean and sterilize a variety of kitchen utensils, including skewers, peelers, slicers, and more. Powerful enough to destroy Staphylococcus, Salmonella, and E. Coli, our utensil sanitizer is completely food-safe. The Sani Station also decreases allergen cross-contamination. Whether you need a Sani Station for a restaurant, church kitchen, school kitchen, or other commercial cooking area, ensure that you’re cleaning and sanitizing utensils properly with our dynamic utensil cleaner system. Try a Sani Station today.